IN what could indicate a last-minute anticipation of large numbers of post-LIVID Novocastrians in search of a good time, organisers have shifted this week's SOUTHERN CULTURE ON THE SKIDS gig to The New Cambridge Hotel. The North Carolina hillbillys will be supported by Sydney's THURSTON HOWLERS, who play a combination of mid-1960s garage punk and reverb-drenched surf guitar. 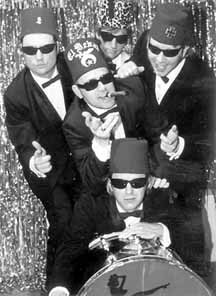 The fez-wearing lodge lizards (pictured), represent a way of life filled with 'seedy burlesque clubs, sweaty dance halls, and high-octane surf and drag'. An advertised gig, featuring DANK, JOKER, YASGUR'S CATTLE and THE LAST SAY, which was to take place at the Cambridge on Sunday, will now take place at the New Orana Hotel on Sunday from 4pm.